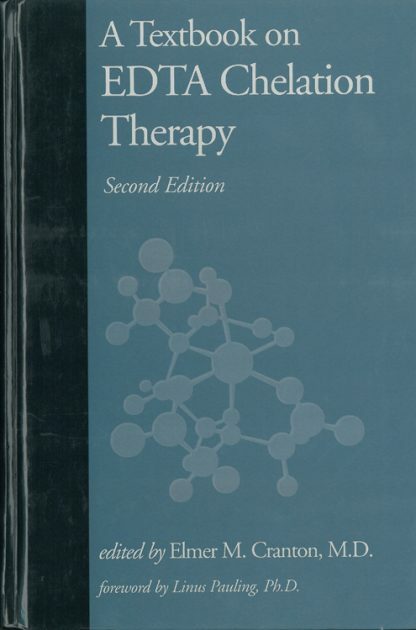 Red Wheel ∕ Weiser Online Bookstore | A Textbook on EDTA Chelation Therapy: Second Edition by Edited by Elmer M. Cranton, M.D. Chelation therapy, based on the intravenous infusion of EDTA, is a highly effective treatment for atherosclerotic cardiovasular disease. Saftey and effectivenss are well documented in clinical studies, all of which to date are supportive of this therapy, and there are no studies showing lack of effectiveness. A strong case is made for the use of this safe, efficacious, and inexpensive therapy before resorting to surgery and other risky and invasive treatments. In this newly revised and extensively updated edition of what has come to be regarded as the definitive textbook on the subject, renowned chelation expert Elmer M. Cranton, M.D., presents the work of the world's leading experts in chelation therapy. "This therapy has been proven effective over and over again in clinical practice," says Dr. Cranton. "More than one million patients have recieved more than twenty million infusions with no serious or lasting adverse effects." In his foreword, Nobel Prize winner Dr. Linus Pauling states, "EDTA chelation therapy makes good sense to me as a chemist and medical researcher. It has a rational scientific basis, and the evidence for clinical benefit seems to be quite strong." Here in a single volume you will learn everything you need to know to responsibly administer and advocate chelation therapy. You will find a coherent scientific rationale, clinical trials demonstating effectiveness, guidelines for saftey, detailed protocols for administration, and techniques for pre- and post-treatment laboratory evalutaion. Foreword by Linus Pauling, Ph.D.